Waldkirch, October 2018 – At the SPS IPC DRIVES trade fair in Nuremberg from November 27-29, 2018 (hall 7A, booth 340), SICK will be showcasing its innovation and technology leadership in many fields. Besides sophisticated service concepts and new business models, for example turnkey image processing solutions, SICK will also be giving attendees a glimpse into the future world of sensor-based edge cloud computing. SICK is inviting its partners in the trade press to attend a tour of its booth followed by a get-together with light refreshments on the evening of the first day of the trade fair. The Smart Service Suite from SICK is both a modular concept and toolbox that allows for a safe and easy introduction to the implementation of Industry 4.0. The digital maintenance manager is the foundation; it displays, administers and monitors a user’s installed sensor basis. Based on this, the visualization tool enables web-based display of measured values and parameters and transfers them to the system condition monitoring. These two products of the Smart Service Suite are supplemented to include project- and customer-specific solutions for predictive system maintenance and – in the future – will involve a prescriptive concept which will enrich this predictive maintenance information with automatically generated handling instructions in the event of maintenance and service cases. Successive improvement of machine availability and production is achieved with every expansion level of the Smart Services. Furthermore, they create the foundation for the development of new, digital business models such as managed services. In addition to its sensor business, SICK intends to focus increasingly on system solutions in future. 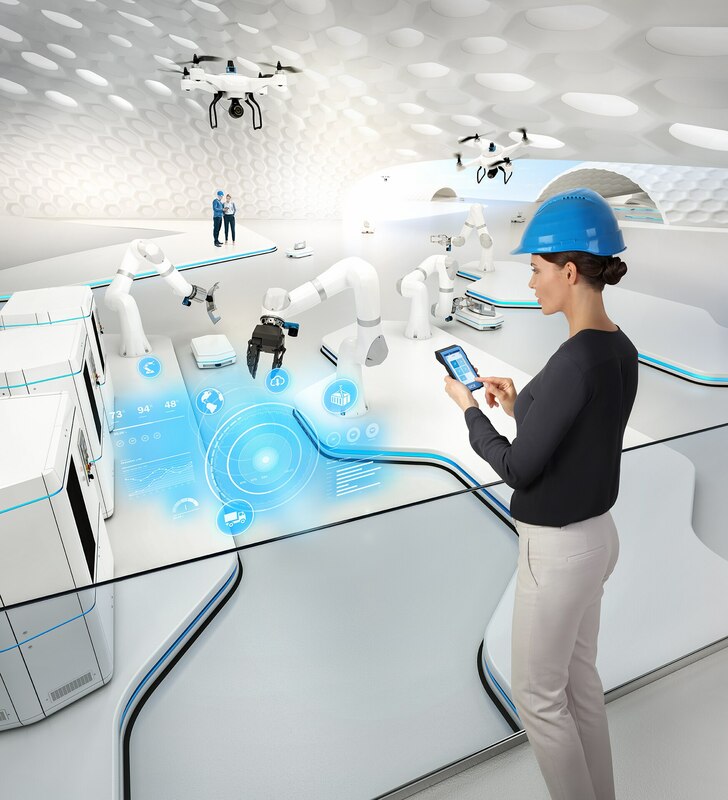 The successful product portfolio for logistics and process automation has been expanded to include complete solutions for the application areas of safety systems, vision, RFID and Industry 4.0, which are also considered important stimuli for automation concepts in robotics. How such a customer-specific, tailored application could look is illustrated by the model of an integrated image processing and identification solution. Using PicoCam streaming cameras and a TrispectorP1000 programmable 3D camera, it is possible to examine electronic components and sensors for the presence and correct alignment of pins, to check the cable layout and housing seals, to inspect the contours and surfaces of the housing, and to detect the presence and location of components. RFID systems can be used to identify individual products and activate the relevant cameras. A SIM4000 Sensor Integration Machine collects the data from the image processing and RFID systems, aggregates them, analyzes them, and uploads them to a simulated cloud environment. The ability to simultaneously integrate several technologies into a single application – in this case vision and RFID – has made SICK a technological trailblazer for new automation scenarios. Simultaneous integration of vision and safety is very important, for example, for cooperative and collaborative human-robot scenarios, which are becoming more and more common. As the leading sensor supplier in the world of automation, SICK is continuing on the path to becoming a provider of customer-specific application solutions and is providing customers with decades of experience in technology and applications as well as extensive project management and integration services to customers from all industries and of all company sizes. The OutdoorScan3 safety laser scanner, which is suitable for stationary and mobile applications, is a novel, electro-sensitive protective device for monitoring horizontal surfaces in an outdoor setting. The laser scanner itself, as well as its scanning technology, have been designed for maximum mechanical and measurement ruggedness “out in the field”. The NanoScan3 is an ultra-compact safety laser scanner that was designed for industrial use and which offers easy-to-integrate and economical reliability for mobile platforms, autonomous carts, and cobots. It is based on the successful microScan3 technology and, being only 101 x 101 x 80 mm³ in size, is ideal for extremely space-critical applications. Furthermore, in addition to its certified safety functions, it offers a large number of automation technology related capabilities, for example for autonomous vehicle control. The TWINOX4 safety light curtain from SICK is used to protect hazardous points, for example at the workstations or service openings of aseptic filling and sealing machines used in the pharmaceutical and cosmetic industries. Structural features such as the media-resistant stainless-steel housing, rounded edges, gap-free design, and IP65 or IP67 enclosure rating, underscore that this sensor has been specially designed for demanding working environments. Consistent switching behavior for all non-ferrous metals while still offering a larger sensing range, highest-possible detection reliability and availability even in magnetic and welding fields, as well as extreme toughness thanks to an anti-slip PTFE coating and durable Duroplast housing – these are the performance highlights of the IMR inductive, reduction factor 1 sensors. These sensors are employed, for example, in welding processes for detecting the presence of parts and monitoring clamping devices, for positioning skid conveyors, for detecting the presence of sheet metal in punching processes, or for monitoring the infeed of material to machine tools. Not rigid enclosure profiles with fixed sender and receiver modules, but instead a flexible “light chain” of cascading sensors that can be flexibly positioned, easily connected, and centrally evaluated – this is the new design concept of the globally unique FlexChain automation light grid from SICK. The up to 60 individual beams of this flexible detection system can not only be independently arranged, but also generated by either through-beam photoelectric sensors, photoelectric retro-reflective sensors or photoelectric proximity sensors – even in a mixed configuration. The cascading of sensors connected to a common FlexChain host minimizes cabling costs. Ranger3 is a newly developed 3D vision sensor that is setting the future standard for industrial 3D image processing in regards to technology, speed, resolution, and ease of integration. This streaming camera, featuring the innovative ROCC (Rapid On-Chip Calculations) technology developed by SICK, can process up to 15.4 gigapixels per second, thereby enabling full-frame 3D imaging (2560 x 832 pixels) at 7 kHz. The Ranger3 transmits the measurement data to an external PC via Gigabit Ethernet using the established GenICam and GigE Vision standards. This makes it easy for users to integrate, since the Ranger3 can be incorporated directly into image processing packages such as Halcon. The compact TriSpectorP1000 programmable 3D camera with its single housing design combines laser illumination and camera optics in a single device, thereby creating a geometrically stable and identical measurement situation in every application. Image processing and analysis have also been fully integrated into the TriSpectorP1000. The high-resolution shape data measured by the factory-calibrated 3D device are outputted in mm values and can be directly further processed. The highlight of this camera, however, is its programmability in the SICK AppSpace development environment – the common programming platform for various sensor technologies from SICK. This enables developers and integrators to use the TriSpectorP1000 to develop custom applications and user interfaces for their image processing solutions and thereby implement customer-specific requirements in an efficient and tailored manner.